There may not have been much blogging going on lately but I have been doing some cooking. Here's a delicious side dish that is different than the average gratin. I found the recipe for Potato-Poblano Gratin over at FOODIE! Roasted poblano peppers give the dish a special twist and it was a perfect side with steak but it would also be wonderful with chicken or pork. Preheat oven to 400 degrees F. Butter a 9-inch square pan and sprinkle garlic over bottom of pan. Arrange 1/4 of the potatoes in the dish. Sprinkle with salt and pepper, then 1/3 of chiles and 1/3 of cilantro. Repeat layer of potatoes, chiles and cilantro 2 more times, seasoning potatoes with salt and pepper. Top with potatoes. Pour broth over, then cream. Sprinkle with salt and pepper. Cover pan with foil. Bake until potatoes are tender, about 1 hour 15 minutes. Uncover and sprinkle cheeses over potatoes. Bake until liquid thickens, about 15 minutes. Cool. Sprinkle with cilantro. 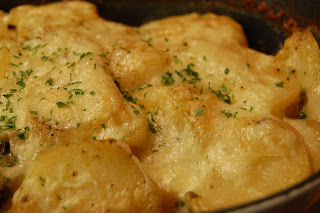 What a tasty version of potato gratin! This appeals to me a lot more than recipes that add sausage or ham. Wow, yours looks better than mine did! haha... I don't think I used yukon gold potatoes, though, and I'm sure that's what gave yours such a wonderful golden color. Yum!